The conference was a very useful experience for all students in the operations/Supply Chain Field, it exposes the industry to students through the eyes and vision of current managers and principals. Moreover, firms attribute their success to managing a global and efficient supply chain and this conference showed us how different companies such as Verallia, Subaru and John Deere focus specifically on this field to meet their huge customer demand and reduce their cost with the minimal trade-off possible. The talk that impressed me the most was "Lean & Green: An Overview of Best Practices in Environmental Stewardship at Subaru of Indiana Automotive ". I never thought that you can be a big car manufacturer and still be a friend of the environment, however Mr. Eastday's presentation gave us an insight on how to create value with even fewer resources and use the process to reduce time wastage and cost. The conference was able to assemble a wide variety of companies in terms of size, reach and areas of expertise. There was absolutely something to gain for all the participants including the company representatives. I thoroughly enjoyed all the speakers and their presentation as they each presented or painted a different perspective of sustainability and continuous improvement. Another remarkable strength of the event was how involved and interested the company representatives seemed to be towards the work/internships of the students. I was quite humbled and energized by that. The organization of the event was remarkable as well as overall timing and transition. I would love to be a part of such an event in the future even after I am long gone from Krannert. Although most of the sessions in the conference was very informative and educative, the part of the conference I liked the most was the first session with speakers from Verallia, Subaru and John Deere opening the conference. This session was of particular interest to me for a number of reasons. Firstly, Verallia was the company I am working with on an ELI and it was of particular interest to learn more about some of the initiatives that the company had towards sustainability. Secondly, Subaru and John Deere are companies that consume a lot of energy and raw materials in their manufacturing and it becomes that much more important to ensure that wastes can be reduced. The session was highly educative and motivating for young professionals and entrepreneurs who will be starting a career in these industries. Knowledge of these company’s initiatives help develop the right business acumen starting their career. This was the second time, I attended this conference. Apart from the natural networking opportunity which all the participants got, I think I had a very successful conference in terms of learning and developing thought capital. The conference was very well organized and industries partners such as Arcelor Mittal, Boeing, Caterpillar, Genpact, John Deere, Verallia etc. created a wonderful collaborative platform for the three pillars of education, students, faculty, and industry. It was really encouraging to notice that Krannert School of Management actively partners with GSCMI to conduct such events. Not only do the students and faculty get an opportunity to interact with each other, but it also sends all the right signals to the recruiting companies. Purdue is fully devoted to develop its students. When I looked at agenda of the GSCMI conference, I was thrilled to notice that there would be a session on Blue Economy. I had read an article a few days ago on the same topic and I was interested to explore the topic more. The GSCMI conference provided me with that opportunity. This talk was given by an award winning change agent and an educator, Mr. Brandon Pitcher. He is the Chief Sustainability Officer at 5 Kingdoms Development, LLC. The Conference was very valuable to me both from a learning standpoint and a networking standpoint. My appreciation goes out to you for putting on the event. There were three companies present which had Supply Chain managers who also recruit here at Purdue that I have developed a relationship with. This is an event that more students should take advantage of! Prof. Shantikumar’s presentation about the new Global Supply Chain Masters degree was super interesting. I am sure that many students and companies will benefit from this new program. 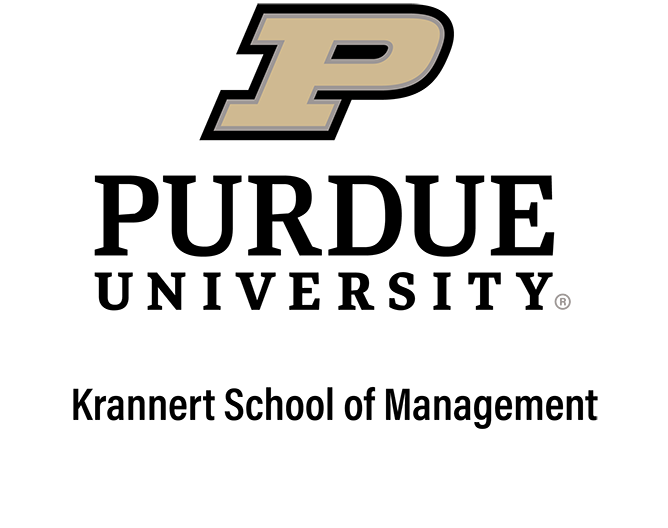 This will continue to enhance Purdue’s leadership in this important area. All in all, it was a great conference that got the students and companies thinking about important issues that will become increasingly important to all of us. The conference as a whole was a great learning experience for me. I had never been to any kind of similar conference or had a class on sustainability, so while I knew about recycling efforts, I knew very little about what else companies were doing. It opened my eyes to whole new ways to make companies more cost effective while also helping sustain our planet. I would highly recommend going to all future Krannert students. My favorite speaker of the day was Brandon Pitcher. I’ve always been interested in science, and he really brought the science of sustainability to the forefront for me. All of the other speakers were great, and they were talking about things their individual companies were doing to become more sustainable. Brandon, on the other hand, was talking about things every company can do to become more sustainable. It really opened my eyes to things I didn’t even know were possible. Thanks to the professors and the volunteers, the event was well setup and the entire conference went along smoothly with no issues. The breakfast and lunches were great and I had a wonderful time listening to the presenters. The conference was definitely a success overall, informative and great speakers all around on a subject that’s very relevant in today’s business world. Sustainability is a topic that will be in the headlines for years to come, and being able to get an in-depth look into how companies today approach sustainability was very informative and eye-opening. It adds a new dimension to my strategic thinking when it comes to process improvement, my field of interest, and challenges me to think not only in terms of bottom line profit, but how the business implications of those improvements align with environmental protection and sustainable operations. It was a wonderful experience to be at the seminar as it served as a common platform for people from various industries to interact with one another and most importantly mingle with the students and faculty of our university. The seminar was enriching as very senior people from the industry educated the students and faculty about the efforts and initiatives undertaken by various companies towards ‘Sustainability’ in their operations. The breadth of the companies represented in the conference was amazing as it had people from diverse industries ranging from automobile to steel to glass recycling. The conference was well-organized and perfectly matched the goal of GSCMI, which is to enhance students learning experiences and connect students with partner companies. Dean’s speech attracted participants’ attention about Krannert SCM program and the Wal-Mart example of associate dean successfully raised issue about the main topic, sustainability. Overall, the conference was live and active. Each company has their own way to approach sustainability. There are some in common and differences as well. Through the sessions, it is impressive that faculty try to provide wonderful opportunities to both students and companies. Even though I am a sponsored student, I am proud that this program can improve Krannert program reputation, helping students and companies. While it is not the most money or resource-saving concern, I was really intrigued by Steve’s presentation and comments on the bottle bills. He mentioned that mixed recycle in cities goes to waste because about 40-50% of it winds up in landfills. This is really sad to me, because people are finally starting to recycle and it is just being wasted on landfills. I started to ask myself (all throughout the day actually I was thinking about it), why don’t more states have these bottle laws. Really the only thing I came up with was that it would add costs for the individual businesses that have the machines at their stores. When I lived in NY I remember returning cans and bottles to the local ShopRite store. I can imagine that they do incur some overhead costs from the machines, because they have to have people maintain them, empty them, do payouts for the refunds, and probably more things that I never saw. It doesn’t really cost anything for the government, they just write the bill and it is done. Even if they didn’t enforce it at all, some people and companies would still follow them. So, if the only cost is on the retailers, the possibly it should be allowed for them to charge $.06 cents, then return $.05 for the bottle (currently it is $.05 for both). That way, they could make a penny on each bottle and can sold, and then have some money to offset costs. Also, possibly the collection network could be privately run. This way (much like the scrap industry) you will gain efficiencies from competition. So basically, I am surprised this isn’t more nationwide. Why isn’t it? I am not sure, but I can’t think of too many drawbacks. If the companies in glass, aluminum, and plastic really do save as much money (and have such a preference) for this cullet and recyclable material, why isn’t it a bigger deal? Are the companies not willing to pay much for it? I am not sure, but it definitely deserves some thought. Eventually, we are going to run out of space for landfills and wish we had have been reusing all of these materials all along. The 2012 Conference was very interesting because, as a student, most of the things I’ve learned so far about operations and supply chain have been in lectures and case studies in class. Aside from plant visits to learn about a company’s operations, this is another way for me to see how the concepts and theories are applied in real life and the impact it has on the company and the community. Having representatives who come from the higher levels of management as speakers provided insight into the strategy and the rationale for a company taking a certain approach. A company’s direction usually comes from higher-level management and being able to hear from these people gave me a better grasp of the company’s operations on a larger scale. This year’s Sustainability theme was particularly interesting because of the increasing global awareness in sustainable operations. The idea of efficiency and globalization and its impact on a company’s bottom line has always played an important role in operations and, until recently, sustainability and environmental responsibility was more of an afterthought than an integral part of the process. What this conference has shown is that sustainable operations can and should be integrated into the decision making process for any company’s supply chain and operations. From what I understood of the conference, European companies seem to be leading the effort in sustainable operations with the US following closely behind it. Coming from a third world country, I can see the potential of applying these practices to my country. Overall, the conference has increased my knowledge and exposure to good practices that I am sure I will use in my future career. I recommend opening the event to the rest of the school with possible collaborations with the Purdue TEDx team to make this a larger and better event as there’s so much to benefit from such a conference and I am happy to have been a part of it. I highly valued that executives from companies in varying industries took time to talk to us and discuss the increasing need for these efforts. We had a wide range of expertise and background at the conference: from undergraduate and MBA students to tenured professors to entrepreneurs to executives from fortune 500 companies. I believe this variety contributed to a collaborative environment. It gave me a new insight into how sustainable practices impacted all of us. For example: green efforts and increasing oil prices drove the growth of David Futa’s rubber recycling business, while Kevin Doyle used ingenuity to eliminate the dumping of waste water into the Indiana Harbor.